Endodontics is the dental specialty that deals with tissues and structures located inside the tooth. One of the most common endodontic treatments is root canal therapy, a procedure which effectively eases the pain associated with a bacterial infection deep within the pulp of the tooth. Of course, root canal treatment doesn't just relieve pain — it also stops the infection by removing dead and dying tissue from the tooth's pulp. Plus, it helps to save the tooth, which is in danger of being lost if left untreated. Yet root canal therapy isn't the only treatment endodontics offers. This field also deals with cases of dental trauma, performs microsurgery on the tips of the tooth's roots, and even helps figure out what's going on when tooth pain seems to come and go intermittently, or when the pain isn't localized at one tooth. So when it comes to preserving your natural teeth, endodontics has plenty of ways to help. What's inside your teeth? 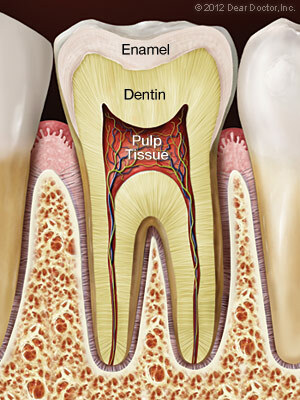 Behind the tough, shiny enamel of the tooth's visible crown lies the sturdy inner tissue called dentin. Dentin is also found behind the cementum that forms the outer layer of the tooth's roots — in fact, it makes up the bulk of the tooth's structure. Similar in many ways to bone tissue, dentin is composed of many tiny tubules which can transmit sensations to nerve cells when it is stimulated. At the core of the tooth, inside small, branching chambers called the root canals, we find the soft pulp tissue. This consists of nerves, connective tissues and blood vessels which extend into the center of the tooth and exit through canals near the apex (tip) of the tooth's roots. When problems (such as infection and inflammation) develop in the pulp tissue, your first indication of trouble may be tooth sensitivity — or intense pain. In time, as the nerves die, the pain may go away… but the problem won't. In fact, if left untreated, the end result may be tooth loss. What could cause the pulp tissue to become diseased and lead to root canal problems? One potential source of infection is untreated tooth decay, which can allow bacteria from the tooth's surface to work its way deep inside. A crack or fracture in a tooth could offer another pathway for microorganisms to infect the pulp. Dental trauma — from a sports injury, for example — may also damage dentin or pulp, or expose it to infection. Extensive dental procedures (such as multiple fillings or restorations on the same tooth) may cause trouble; occasionally, even routine procedures like orthodontics may eventually lead to root canal problems. First, you will receive anesthesia (usually a numbing shot) — and for many patients, the worst is now over. Next, a small opening is made in the tooth surface to give access to the pulp chamber and root canals. Then, tiny instruments are used — often with the aid of a microscope — to remove dead and dying tissue from inside the narrow passages. These passages are then cleaned, disinfected, and filled with a safe, inert material. Finally, the opening in the tooth is sealed to prevent contamination. Other endodontic treatments may be recommended for removing sources of infection and preventing future problems. Following an endodontic procedure, it may be necessary to have a restoration (such as a crown) placed on the tooth to restore it to full function and aesthetic appearance. After that, with proper care the restored tooth should last for many years.